Last weekend, Brooklyn was home to its own rendition of SXSW called the Northside Festival, an event filled with music, tech startups, and most importantly, the Red Bull Creation completion. 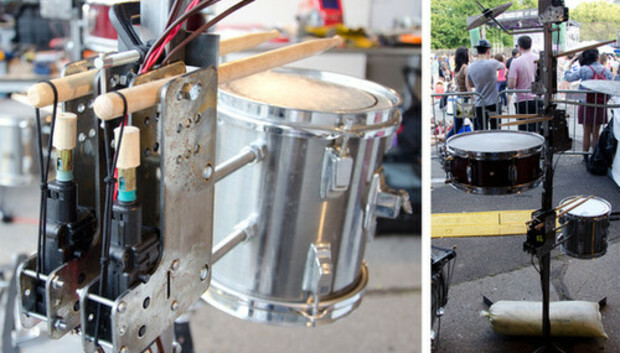 This year's Red Bull Creation challenge was called Signal to Noise: Makers had only 72 hours to build themselves a DIY instrument from scratch. One of the most impressive projects I saw was Autoloop by MB Labs. Think of it as a synthesizer that's on some seriously geeky steroids and, oh, did we mention that it's attached to a robotic drum kit? Autoloop's main component is a table comprised of two interactive surfaces. One edged with a blue outline basically acts as an audio sequencer that plays music once you roll a couple of metal marbles into the holes on its surface. Autoloop can sense where the metallic balls are thanks to two webcams pointed upwards underneath the table. The cameras are set to sense changes in light and when it notices an object on the table, it tells an automated drum kit to kick it. Adding marbles in concentric circles tells the drum kit to hammer on a beat with a single drum. Meanwhile, straying away from the original circle signals the kit to activate even more actuated drumsticks. On the other side of the table is a red-rimmed surface that looks more like it belongs in Air Hockey, except with sensors along the edges. When you place a shape in the center, these sensors measure the distance between the object and the edge of the surface. It takes this data to create an electronic rhythm as well as a melody to go with the drum track. The MB Lab team members say they drew inspiration from old music boxes, which includes just about everything from player pianos to those toy music boxes with ballerina figurines. At the same time, Autoloop is an incredibly cool analog-to-digital-to-analog synthesizer that doesn't sound half bad either. The judges liked it, too--so much so that MB Labs walked away with the Red Bull Creation grand prize of $10,000. Congrats.